It was a dark and stormy night. Actually it was an overcast, lowering day but our hearts were full of giddy joy as myself and three stalwart companions breached the battlements of the Walt Disney Family Museum in honor of fellow Disney Geek Will R’s 21st+ turn around the sun. 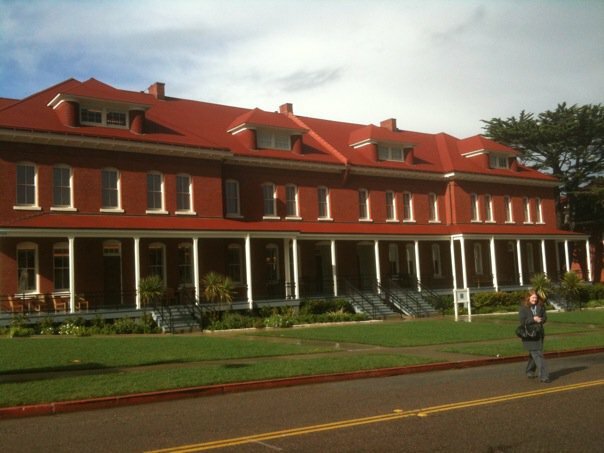 This wonderful museum to “All Things Walt” was built in the Presidio, a former army base by the Golden Gate Bridge. Why San Francisco for a museum about Walt? Well, firstly this museum is about the Man, not just The Mouse and was paid for with Disney family money. The Disney Corporation did not build this. Walt’s daughter, Diane Disney Miller, lives in Napa with her husband, LA Rams football star &amp; former Disney Studio CEO, Ron Miller. Together they own and operate the award winning Silverado Winery in Napa. Thus the museum to her Fathers memory in the area where they live. This museum is inspiring, tasteful and widely encompassing. It fills 2 floors and starts with Walt’s birth and childhood in Marcelline, Illinois. It features tons of family photographs, an ambulance similar to the one Walt drove as a teen in WW1 in France. 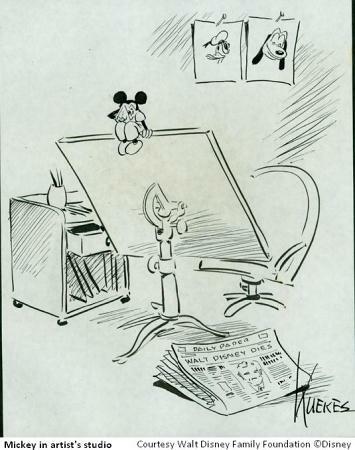 You see his early animation works (Laugh-O-Gram Studios), his partnership with Roy, the live action Alice Comedy films, Oswald the Lucky Rabbit, the loss of rights to that character and the birth of Mickey Mouse. You see cells from Snow White, Walts special one of a kind Oscar for that film which included one standard Oscar statuette along with 7 small ones on “stairs” next to it. This Oscar was presented to Walt by Shirley Temple. There is a section that discusses color mixing, ink &amp; paint, original cells and the infamous Multi-Plane Camera (of which they have one and yes it is HUGE). http://en.wikipedia.org/wiki/Der_Fuehrer’s_Face, realism in animation shows itself in Bambi, Walt’s pet project that was way before its time – Fantasia and the revival of the Studio with Cinderella. You see Walt’s hobbies such as polo, pictures from his vacations with Lillian to Europe and South America where he worked on live action shorts. There are family mementos, watches, pictures, lots of interesting things that give you a peek into the life of Walt. However, the Museum does not gloss over the rough patches. It documents The Strike in detail. How betrayed Walt felt and the feelings from the workers on the other side. It should be noted that not all of Walt’s people went on strike and not all of them felt work conditions were not fair. However the Studio changed after that and so did Walt. There are pictures of Walt at home, making sundaes for his daughters (Diane and Sharon) and their friends. The most thrilling part for me personally was seeing the original Carolwood Pacific Railroad cars. This was a live steam powered train that Walt would drive, give people rides on and ran on a track in his backyard of his Holmby Hills house. It seems animators Ollie Johnston and Ward Kimball had their own backyard trains which got Walt obsessed with his. You see the birth of Disneyland. There is a special miniature Disneyland that includes all the rides (and only the rides) that were either original to Disneyland or that Walt worked on. Thus the most recent ride is Pirates of the Caribbean. If you look above the firehouse on Main Street, you see the lamp in the window that is always kept on, just like at the Park. If you look sharp you will see two Walt’s on the streets. There is an area devoted to the television shows such as The Mickey Mouse Club, The Wonderful World of Disney and The Wonderful World of Color. As we travel by a replica of Walt’s office at the Studio and the planning of Walt Disney World, especially Walt’s vision for EPCOT, you know where this is going and it is not a happy place. 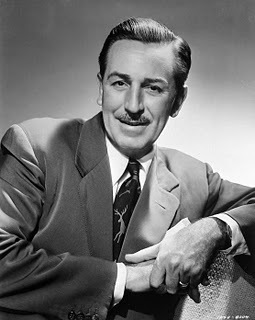 Walt Disney died of lung cancer on December 15, 1966 in Burbank. However in spite of the sadness that this great talent has gone, you are left uplifted by the body of his work that lives on and brings joy to so many people. It is a shame that Walt’s daughter Sharon did not live to see this as she passed away in 1993. There are so many things that fill this museum that it really does take 5-6 hours to take it all in. Tickets are available on-line and are timed for entry however when the weather is bad and tourist season is low (winter), there is never a problem getting tickets. They also have a theatre which features one Disney film a month along with films on special topics and seminars. If you are peckish, they have a counter that sells lovely sandwiches, salads, cookies, lemonaide, etc. Adult admission is $20, Seniors and Students (with ID) are $15 and Children 6-17 are $12, Children under 6 are free with Adult paid admission. These prices are MORE than reasonable for a day of one of a kind entertainment. If you are a Member, free admission is one of the perks. Memberships are priced from $55 – $500. If you are in Northern California, this is not to be missed. It is TONS better than wandering around the Haight looking at aging hippies. Trust me, you will love this! Posted on March 27, 2010, in Uncategorized and tagged museum, presidio, Walt Disney. Bookmark the permalink. Leave a comment.